We’re not exactly sure why we choose to buy “vanity” car license plates to broadcast a message to the world about our identity. 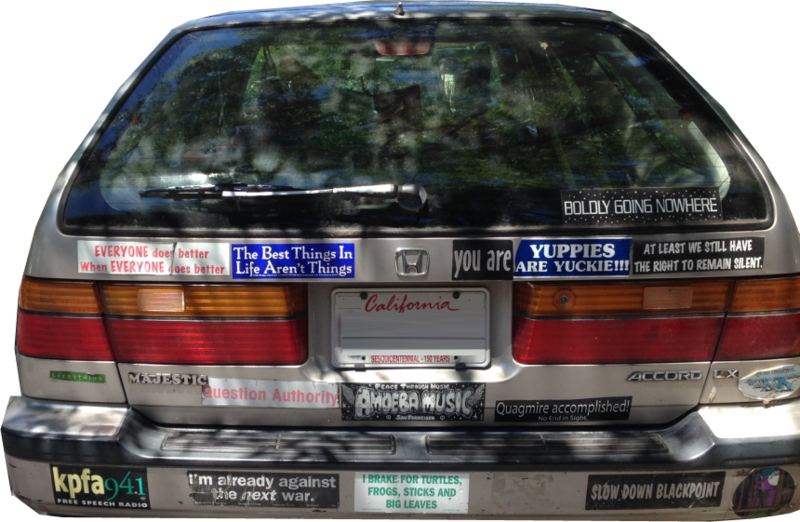 We don’t know why we put bumper stickers on our cars and trucks to shock, tease, inform, show our allegiance, or just have fun, but we do love our free speech, and we show it. We will share with you bumper stickers we’ve seen. Enjoy! Here are notes about two bumper stickers that might require some local reference. (1) KPFA 94.1 Free Speech Radio is an ultra-liberal radio station in Berkeley, California. Its programming reflects the fact that Berkeley is the home of the University of California, Berkeley campus. Many people remember that UC Berkeley is the home of the Free Speech movement that began in 1964 and continued until 1970 with rallies in Sproul Plaza where students protested America’s continued involvement in the Vietnam War. (2) The bumper sticker for Amoeba Music refers to a one-of-a-kind music store on Haight Street in San Francisco. It caters to indie, classic, and modern music of every genre on CD and vinyl. It buys vintage vinyl and CDs at the store. Words can’t do it justice. It’s on the recommended spots-to-visit for any SF tourist.